Wizards of the Coast has allowed the campaign admins to share the Ashes of Athas campaign adventures (20 adventures organized into 7 chapters). To order the adventures, just use the Contact link and send me your e-mail address. Last time we spoke about how Chris Sims provided the concept of the PCs as members of the Veiled Alliance so as to create unity. Chad Brown, (former Admin) Matt James, and I all worked on a draft for the three adventures, then we broke off to each write one. (By the way, check out Chad Brown here talking about his latest project, the Pathfinder Adventure Card Game. As a team, we soon discovered that when we broke off what we wrote didn’t always come out as we had planned. It was easy for each of us to get wrapped up in the individual adventure and diverge from the original goals. Our original vision for AOA1-2 was to reveal that the True also active in Altaruk, then focus on diplomacy and politics while establishing Altaruk as a new home in which the PCs had a personal stake. When we got back together, 1-2 was mostly about escaping the True. This happens in home campaigns too, right? We set up plans to do X, and instead end up doing Y. With Ashes of Athas adventures the admins reviewed the adventures and then did a development pass. (We also began communicating more during our design process for other chapters.) The development process looks at the original goals, assesses the written work with fresh eyes, and then makes refinements to improve the experience (and correct any balance issues). We had a big decision to make. Did we change a lot of what we had written to go back and accomplish all of our goals? 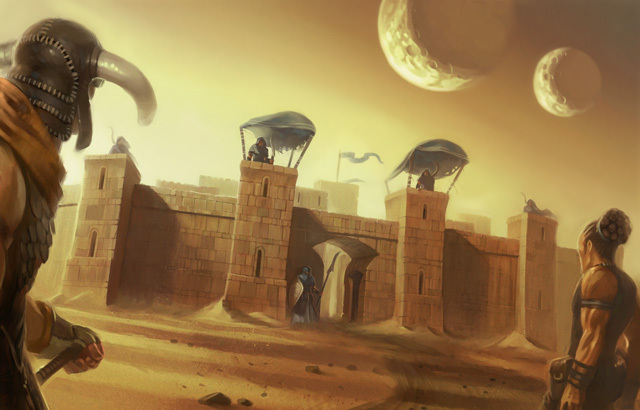 The adventure as written didn’t really have much about the various factions of Altaruk, and Altaruk is a city driven by competing merchant houses. Those houses are in turn sworn to obey the will of the city-state of Balic, which is often competing with the PCs’ old home base of Tyr. PCs arrive in Altaruk, hoping it is their new home and safe from the True. Sartaj, their cell leader, has contacts. Surprise: Sartaj is actually the daughter of the leader of Altaruk, but right when the PCs meet him he is assassinated and the PCs are framed. The PCs can find evidence that the True are responsible, but are pursued by the town guard. The interim governor is corrupt and tries to frame the PCs. It was very linear, but there were some neat scenes there and some nice surprises. 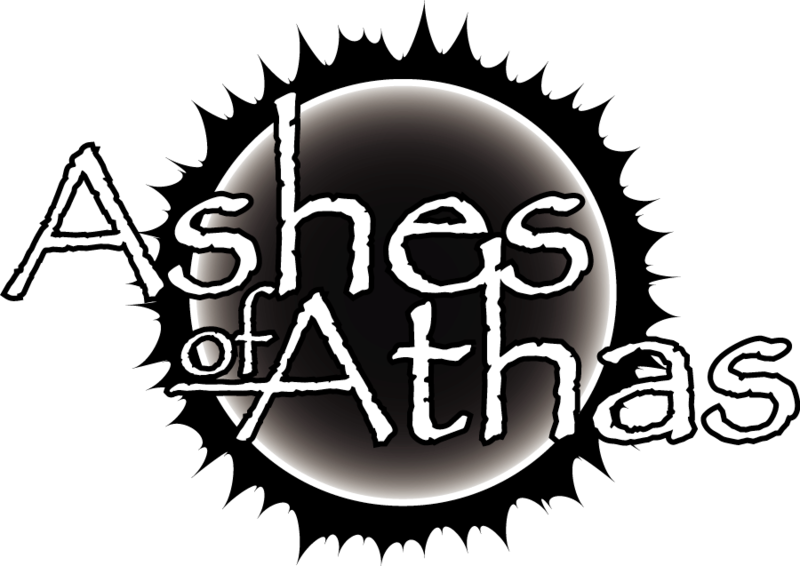 It furthered our goal of having Ashes of Athas be largely about a story. During development we decided to make three big changes: 1) We worked to develop the character of the town, so that Altaruk would leave a lasting impression. 2) We wanted to open up the encounters a bit more, so the encounters could allow for PCs’ actions to have an impact. 3) We wanted the PCs to feel like this was home base. 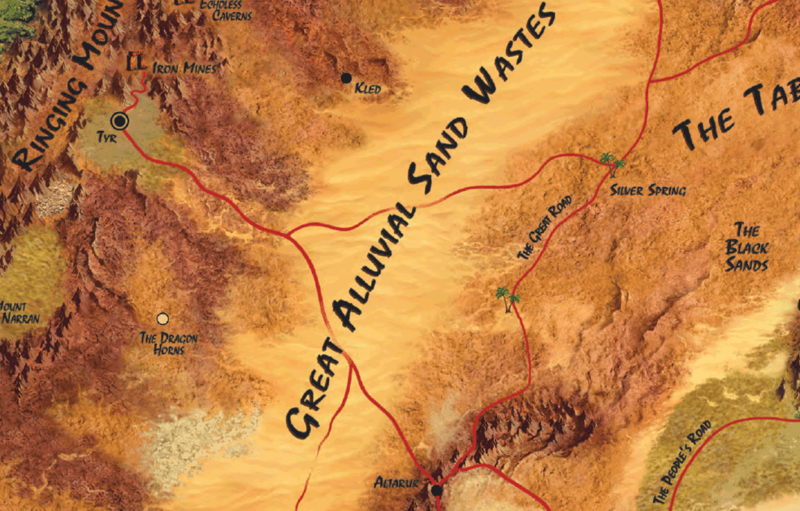 There is a lot about a Dark Sun town, and Altaruk in particular, that is distinctive. We wanted those elements to register PCs, so we sprinkled them throughout the adventure. We also tried to make them integral to the scenes and what the PCs were doing, so that the players would recall them later. Our introduction provided the geographical location (visually striking, since it is on the shores of the Sea of Silt) and the reputation of the town’s governor as being a good person (important, because he’s about to die and then be revealed as their cell leader’s father). We gave some time for the PCs to explore the town. Here we provided the DM with ideas on what they could describe in various locations. In the market, for example, the emphasis is on how the stalls are owned by one of three Balican merchant houses, as well as the goods for which Altaruk is known. The Magistrate’s Office is seen, which will feature later. We describe various businesses, including a potter and tanner (which will come up later). By letting the DM drive we hope they weave the important details into what the PCs discover, creating a memorable scene. Finally, we sprinkled in some information and rumors the PCs could pick up while speaking to NPCs, so as to give the DM thinks to talk about through NPCs. We mentioned above how we gave the DMs and players freedom in exploring the town. They then went to meet the governor at a dinner. This part wasn’t flexible. An assassin strikes, escapes, and guards arrive and accuse the PCs of being responsible. The PCs escape and Sartaj asks them to prove the True’s role and their own innocence. This led directly to a skill challenge across several scenes. Here we tried to breathe some flexibility into the experience, so players felt they had options and their actions mattered, even if the adventure was fairly liner. During our skill challenge we chose scenes that distilled the nature of the town. At one point the DM can select from a few scenes, such as the PCs walking through the dark rows of sleeping beasts of burden (Altaruk’s main commerce is in mounts and beasts that haul caravans). Guards belonging to a merchant house are approaching and the PCs have to improvise. One table set the mounts free. Another climbed onto a roof to escape, trying to be quiet. A third used skills to placate the beasts. Players and DMs collaborated, but did so around a framework that reinforced Altaruk’s distinctive elements. In between scenes where the PCs evade the guards and merchant houses, the PCs also follow up on clues. Clues lead them to the Potter, who is aligned with a merchant house, and where there can be some fun RP around the potter’s young apprentice. The apprentice is a ne’er do well, and the PCs can expose that or profit from that. Either way it can be fun and lead to the next encounter and helps shape the next encounter. We also added a bit of flexibility to the last two combat encounters (a typical 4-hr organized play adventure has 2-3 combats, two RP scenes, and a short skill challenge). In the next-to-last scene, the PCs are trying to take their proof to the magistrate, the only one with the authority (since the governor is dead) to call off all the groups hunting them down. However, in the square outside the magistrate’s building they find a corrupt guard captain. He wants them to be dead so he can be the one to have captured them and profit. He doesn’t care about their innocence at all, but will accept their surrender (and takes them to the magistrate). Captain Jax was built to last, and in many cases PCs worked to run past him or incapacitate him rather than defeat him. We also added a mob swarm, which at some tables was convinced to disperse. We always want to drive home that this is Dark Sun. Leadership is corrupt. When the PCs reach the magistrate, they find that she too is corrupt. She wants to become governor, and what better way than to capture culprits? If Captain Jax is still here, he again joins the fray. The magistrate was fun. We gave her whips so she could push and shift PCs around while insulting them. Parties can convince the guards to join them or some may leave to face Sartaj when she joins the fight. The two encounters really played out differently at different tables, creating unique stories for the players. Development can only do so much in a short time period. We had made Altaruk distinctive and created some fun elements that allowed players and DMs to shape the story, but we hadn’t managed to make Altaruk feel like home. We did some minor things, such as having the PCs be seen as something very unique on Athas – heroes. A story award captured this, emphasizing how Altaruk’s citizens reacted to their bravery and fight against corruption. Sartaj was named interim governor. The political situation was left volatile and the PCs freed so long as they brought back the fleeing assassin or further proof. This would really change our future writing. In Chapter 2 we would come back and delve into the politics of Altaruk and further try to cement Altaruk as a home for the PCs. Make the PCs home clear: Players need a clear indication when a new place will become their home. Communication: As an admin team we really learned from this first chapter. It was really easy for us to become focused on our individual work and stray from our original goals. Sometimes that was great, leading to new ideas. But, we wanted more communication across the team as we worked. Development is the key: We also really saw the value of a strong development process. Development could identify issues the author simply can’t see and then as a team we could work on improvements. DMs can approximate this by stepping away from their work for a bit. Let some time pass, then come back to the work with fresh eyes. And, a home campaign DM can and should make changes on the fly. If an encounter feels like a railroad, shake it up and see what the PCs choose to do and follow their lead for a bit. Understand reality: When discussing development it is important to note that an organized play campaign is run by volunteers. We did a lot of work around 2AM and way past original deadlines. Such is the reality of volunteers with competing interests such as families and jobs. Still, it was possible for us to bring great improvements to adventures through the development process. Next time we will talk about another critical element: Playtesting. This entry was posted on October 20, 2015 by Alphastream and tagged 4E, Ashes of Athas, Authoring, Challenge Level, NPCs, Setting, World-building.